Bidding peaked at 26,000gns, 12 lots traded at five figure sums and 140 lots sold to average £6,538, a figure representing 73% clearance leaving Charolais to once again take the lead at the spring multi-beef breed sales and grossing just short of £1 million in total. Sale leader at 26,000gns was Maerdy Hearthrob TI +56, SRI +50, a 19 month old from Flintshire vet, Esmor Evans, Mold. Sired by Maerdy Dynamite, he was out of Maerdy Beauty who secured the Royal female championship and Royal Welsh interbreed titles as an 18 month old. Hearthrob sold in a three way split to Drew and Bob Adam, Glamis, Forfar; Bill Bruce, Balmyle, Meigle and the Campbell family, Thrunton, Alnwick. “He’s a top bull by a great sire I’d seen as a calf and out of a fantastic show cow – a combination which doesn’t happen very often,” commented Bill Bruce. “My confidence in this bull is reflected in the fact I’ve retained several hundred straws,” said Mr Evans, whose success didn’t stop there. In fact the day went on to be one of the best ever in over 30 years of trading at Perth and Stirling. He sold a string of seven bulls to average £13,155, whilst 24 hours earlier he had secured the champion group of three with Darkvador sons, a title he’d won 12 months earlier with sons by Darkvador’s sire, Maerdy Blackout. This week he also won both the junior and intermediate titles. The latter was awarded to Maerdy Hasse TI +48, SRI +50 who went on to receive the overall supreme championship which for Mr Evans was the eighth occasion and earned him the record holder title. The 19 month old Hasse happened to be the next lot in the ring selling for the day’s second top 25,000gns price to join Ronnie Baillie’s 60 cow pedigree herd and 250 commercial cows at Deerness, Orkney. “This bull has the looks and the figures to match – he’s a very nice all-rounder,” he said. Sired by Darkvador and out of Maerdy Dredge, a Vald’Or-Ra daughter, he was described by the judge, Roy Milne after his five hour stint as ‘near to perfect as you’ll ever get’. “Hasse stood out as soon as he came in to the ring. He has tremendous presence, great character in the head and is very balanced; he has a smooth shoulder, length, width across the top, an adequate hind end and great locomotion." Next at 15,000gns was the junior champion, the 17 month old Maerdy Hwre TI +48, SRI +41, another Dynamite son and out of a homebred dam by Maerdy Ulm. The buyer was Mornity Farms, Alyth, Blairgowrie. A bid of 22,000gns secured the reserve senior champion, Lochend Hickory TI +55, SRI +38 for Strathisla Farms, Ruthven, Blairgowrie. Sired by the 10,000gns Mortimers Echo, his homebred maternal granddam remains one of the best breeding females with her 18th calf at foot within the Millar family’s 30 cow Lochend herd based at Port of Menteith, Stirling. For Iain, Rhona, John and Teen, it was their most successful day in 19 years of breeding pedigree Charolais, whilst for Strathisla Farms’ Adrian Ivory, Hickory was the only entry marked in the catalogue to join his 40 cow pedigree herd. “He’s a cracking bull and he looks the part. He has length and width and very sound figures,” he said. Next at 17,000gns was the class winner, Sandelford Harrison TI +45, SRI +45, an 18 month old by the 14,000gns Goldies Usher and out of a Drummeer Major sired homebred dam. Harrison was bred and exhibited by the Henderson family, George, his son Gary and grandson Gareth, Bushmills, Antrim, who realised their highest price at auction in 37 years since establishing their herd which amounts to 10 cows. Harrison went to join Peter Vasey’s 50 cow pedigree herd based at Wetheral, Carlisle. “This bull has unbelievable conformation, power, a good pedigree and figures to match,” he said. Mr Vasey was investing some of the earnings from his string of seven bulls, each by the 10,000gns Carlisle champion, Ratoary Ferguson, and which sold to average £6,030. His leader at 10,000gns was the 19 month old Edenhurst Heritage TI +57, SRI +57 to CG Greig (Farms), Gateside, Fife. Ballindalloch Hero TI +42, SRI +42 lived up to his name for father and son team John and Raymond Irvine, Tomintoul, Ballindalloch and ensured they maintained their winning streak in Stirling for the third consecutive year. After securing the reserve intermediate championship, Hero was pulled in to overall reserve supreme place before going on to command a 13,000gns bid from Corskellie Farm, Rothiemay, Huntly. This 20 month old was sired by Lochend Hero and out of a homebred dam from their 45 cow herd. Later in the day the Irvines offered Ballindalloch Hagar TI +54, SRI +52, a Maerdy Eryr son for 8,500gns to GR Davies, Cwmtirmynach, Bala. The day’s second 13,000gns call went to Allanfauld Hustler TI +31, SRI +30, a 21 month old first class winner from father and son team, Archie and John MacGregor, Kilsyth, Glasgow. Sired by Elgin Davinci he went home with D Morrow, Coleraine, Antrim. The MacGregors next entry at 12,000gns was Allanfauld Highlight TI +44, SRI +44, a 21 month old Woodpark Elgin son and out of a Harestone Tyrol sired homebred dam. The buyers were John and Peter Howells, Llanwennog, Llanybydder. Peter Heath, Hartfield, made yet another successful 1,000 mile round annual trip this time with Sackville Hercules TI +33, SRI +31, a 22 month old by the 30,000gns Balmyle Bollinger and out of a Maerdy Vamp sired homebred dam from his 20 cow herd. Hercules secured the senior championship, the first ever major Stirling award for Mr Heath before selling for 11,000gns to CG McGillivray, Chapeltown, Ballindalloch. A second 11,000gns call was made this time by A and D Renwick, Dundonnell, Rossshire for Martland Heavyweight TI +38, SRI +36, a 20 month old class winner by Beanhill Echo from J and C Wylde, Woolavington, Bridgwater. Balthayock Haakon, the highest entry in the catalogue with a TI +78 and SRI +71, was secured for 10,000gns by Milne family, Robbie, Barbara and their son, James to run with their 320 cow herd at Oldmeldrum, Aberdeen. Bred by David and Nick Walter, Balthayock, Perth, the 16 month old Haakon was by the 8,000gns Swalesmoor Cracker, the current highest recorded bull for performance traits in the breed herdbook and out of a Balmyle Thunderbird sired homebred dam from their 80 cow herd. Next from the Walters at 8,500gns was Balthayock Herald TI +46, SRI +55, a 29 month old Balthayock Dante son. The buyer was Messrs Bindloss and Sons, Shap, Penrith. Neil and Graeme Massie, Dinnet, Aboyne offered their top lot, at 9,500gns to E Innes and Sons, Glenlivet. Blelack Highflyer TI +58, SRI +55 was a 21 month old class winner by Ugie Dynamo. Thrunton Highlight TI +52, SRI +48, a 21 month old by the 26,000gns Balmyle Dickler attracted a 9,000gns bid from Lewis Forster, Hexham for the Campbell family, Ian, John and their father Colin, Thrunton, Alnwick. Another Dickler son, the 19 month old Thrunton Highflyer TI +50, SRI +44 made 8,500gns and also returned to Northumberland this time with P Charlton, Kirkwhelpington. Four more entries sold to 8,500gns. First to go was Gretnahouse Hugo TI +58, SRI +61, a 21 month old by the 12,000gns Wesley Equinox and out of a Mortimers Roselier sired dam from Alasdair Houston, Gretna Green to John Preece and Sons, Hardwicke, Cheltenham. 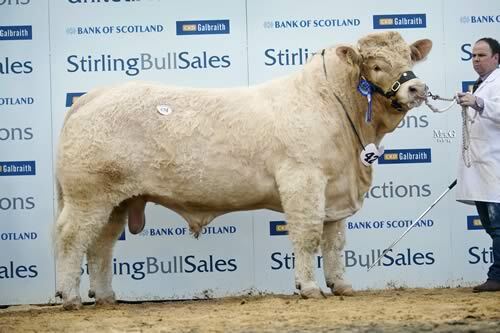 Next at 8,500gns was Baillieston Hector TI +48, SRI +50 to D Peebles, Pittenweem, Fife. A 20 month old Maerdy Deiniol son, he was the highest of a handful of entries from Ronnie Baillie and contributed to recouping his spend earlier in the day. Ugie Henry TI +57, SRI +51, the Wilson bred 18 month old by the 12,000gns Goldies Elation was offered by the Milne family – Roy, Kirsty, Matthew, James and Sam, Llanbryde, Elgin for 8,500gns to T Smith and Son, Alford, Aberdeen. The last 8,500gns call was made by Murray Lyle, Mid Cambushinne, Dunblane for Elrick Historian TI +58, SRI +51, a 17 month old by the 16,000gns Thrunton Fearless from Michael Massie, Auchnagatt, Ellon. Six lots were bid to 8,000gns. First in the ring was Culnagechan Hercules TI +33, SRI +33, a 21 month old by Sandelford Bergkamp from Derek Hume, Randalstown, Antrim to RJ Shennan and Sons, Turnberry, Ayr. Next came a trio of 20 month old entries at 8,000gns each from Colin Wight, Biggar. First were twins by Kelton Trident: Carwood Harris TI +45, SRI +37 went to Terry Coghill, Birsay, Orkney, whilst Carwood Haggis TI +31, SRI +29 sold to Messrs Walker, Granthouse, Duns. Carwood Harry TI +34, SRI +41, an Elgin Emperor son changed hands with JM Nisbet, Mauchline, Ayr. Coolnaslee Hussar TI +30, SRI +31, a 19 month old class winner and NI National Charolais Show junior champion made 8,000gns to AJ Beaton, Struan, Isle of Skye. Sired by the 9,000gns Goldies Carnival he was offered by Gilbert Crawford, Magherra, Derry. The final 8,000gns call was made by Peter Watson, Durris, Banchory for the class winner, Westcarse Highlight TI +52, SRI +45, a Mortimers Echo son from John Christie, Stirling. Esmor Evans rounded off the day by heading the female section at 5,000gns with Maerdy Gunhieda, a rising two year old served heifer by Vald’Or-Ra to JA Morris, Thurso. Maerdy Gwenllian, another same age served heifer by Dynamite made 4,000gns to T Smith and Son, Alford. A draft from John Christie’s herd was headed at 4,000gns by Westcarse Caroline TI +30, SRI +33, a seven year old Roselier daughter sold with her five month old heifer, Westcarse Imogen by Mortimers Echo. The buyer was EF Mutch and Son, Forglen, Banff. Other leading female entries included Midlock Holly TI +45, SRI +39, a 19 month old Kelton Trident daughter at 4,500gns from John Wight, Midlock, Biggar to Reece Millichap, Tonwyesail, Mid Glamorgan. Hamish Goldie, Ruthwell, Dumfries offered Goldies Grandgirl TI +29, SRI +25, a two year old heifer by the 25,000gns Thrunton Camelot at 4,000gns to G Dalgarno, Brechin, Angus. Twenty four hours earlier, the female line up was leaded by two heifers by the 12,000gns Thrunton Explosive from Michael Durno, Glenlivet, Ballindalloch. Supreme honours went to Glenlivet Hooray TI +35, SRI +36, an 18 month old twin out of Kelton Bonnie. She made 3,400gns to AK Brooke, Glenluce, Newton Stewart. Darren and Donna Knox, March, Cambridge paid 3,400gns for the reserve champion, Glenlivet Hopeful TI +34, SRI +36, a 17 month old out of a homebred dam.